After the First World War there were ex-servicemen who had lost a hand, and one of the reasons for introducing the Hattersley domestic semi-automatic treadle powered loom to the island, was to give them an opportunity to make a living for themselves. Originally designed for the Balkans, Turkey and Greece, these looms eventually caught on for everyone in Lewis and Harris, because of the superior speed of cloth production and the more intricate patterns they could weave. Lord Leverhulme’s interest in the industry, coupled with the serious decline of the herring fishery and the poor price of cured fish from the long line fishery, meant that weaving became a much more important part of the island economy. He had great plans to build weaving sheds close to townships to house a number of Hattersley looms. The weavers would be employed from nine to five, six days a week, weaving tweed for a wage. However this arrangement did not suit crofter-weavers, who would only weave when the croft work allowed, and the idea was eventually dropped. Hugh Mackay, Carishader, bought the very first Hattersley loom in Uig; it was a single shuttle model. He was a marine engineer, trained in Glasgow, and could strip down the loom and reassemble it without difficulty. If he had a problem, he had no one locally to ask for advice, so he would get on his motorbike and go to Stornoway. However he admitted that quite often he had forgotten the solution, by the time he got back home! 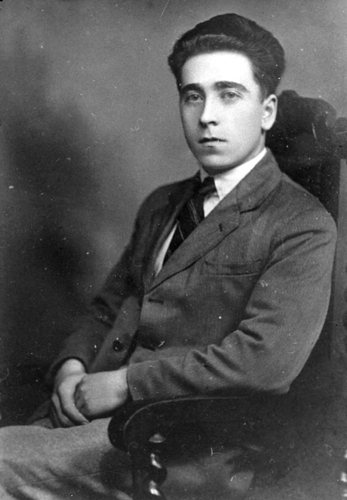 In 1936, John Buchanan of No7, Valtos, organised a meeting at Valtos school for local people. Pat Skinner from Kenneth Mackenzie Ltd was there and they arranged for Alasdair Hare from Lochs (mac piuthair Tharmoid Doinn), known as ‘am Breabadair’, to stay in the village for a few weeks. He went from shed to shed teaching as he went. 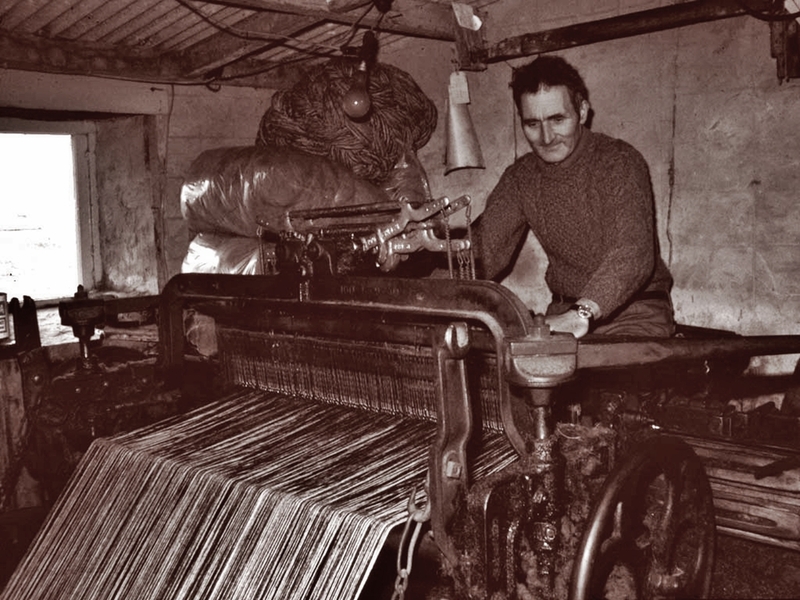 The first treadle powered loom did not appear in the upper end of Uig until 1936 or so. Murdo Maclean, No. 1, was the first person in Brenish to buy a Hattersley. In Islivig the first of these revolutionary machines appeared at No. 1 in 1946, and Iain Tobaidh paid £65 for it. Others bought their looms from Peter Macritchie, Ardroil. Before the war you could buy a loom from him for £40, and when you were earning some money from the tweeds, you could pay him back in instalments. (In 1980 a new Hattersley loom cost £6000). It didn’t take Iain long to pick up the skills needed to keep the loom running smoothly. His father filled the bobbins for the shuttles, using a converted spinning wheel, but he had quite a job keeping up with the loom. Eventually in 1948 they bought a treadle powered bobbin winder for £14, and this could fill three bobbins at a time. A second-hand Japanese one-horse power engine, and an extra spindle were soon added; in 1954 the engine became redundant when the electric arrived. The first tweed woven on the miraculous machine measured about 40 weaver’s yards (a weaver’s yard is 8 feet). This meant that the piece of cloth was well over 100 yards long, though only 29 inches wide when shrunk. For this he was paid £2.18/0, which was better than the 1/- a weaver’s yard, paid in 1939. He could usually manage two or two and a half tweeds a week, depending on the croft work. Is the Hugh Mackay mentioned here the son of John Mackay and Mary Morrison, born about 1841? This Hugh (Uisdean Iain Uisdein Iain) is the grandson of that Hugh 1841, and a son of John 1871 who had the shop, and an uncle of Wheel who lives in Carishader now. Further enquiries have clarified that he was probably a weaver before he went away to Glasgow – he spent his working life there as an engineer and retired to Doune Carloway, where his wife was from. You may be interested to know that we are finally getting our teeth into Carishader/Miavaig genealogy! Thanks for that, Sarah. Glad to hear that you’re working on Carishader/Miavaig genealogy. A book was published earlier this year called “Australia’s birthstain’ challenging views on convicts transported to the Australian colonies. Angus MacKay featured prominently in the book – in the best possible light, of course! Cas air creathaill, ‘s làmh an cuigeil, comharradh na deagh mhnà-taighe. Foot to the cradle, hand to the distaff, mark the good housewife.